Thursday August 9, 2018 - The Senate Public Accounts Committee has recommended for the arrest and prosecution of Internal Security Cabinet Secretary, Fred Matiangi, and Education Principal Secretary, Belio Kipsang, over the Sh 1.5 billion Ruaraka Land Scandal. In a report tabled at the Senate on Wednesday, the committee recommended the two to be investigated over the scandal. 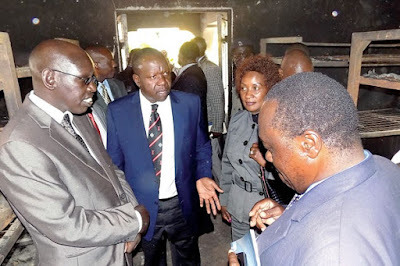 “Carry out investigations on the circumstances that caused then Education CS Matiangi and Kipsang to ignore recommendations of the quality assurance and standards assessment report," part of the report stated. The report says Matiangi and Kipsang disregarded the Ministry's internal report on authorizing a Sh1.5 billion payment for the property. A team from the Ministry of Education had warned Matiangi and Kipsang against paying money for the piece of land arguing that the land was public property. If found guilty, the two will be barred from holding public office. The 13.7 acre land neighbours GSU headquarters, De La Rue and the Kenya School of Monetary Studies.